After this match, there was Pep Guardiola saying the lesson is never give up. 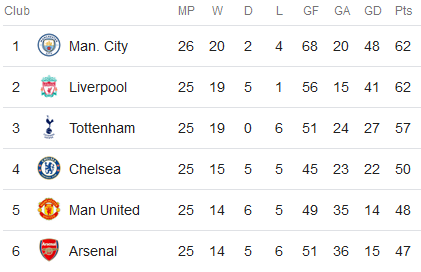 No legitimate contender's gonna pack it in with three months left in the Premiership season, and big-brand, big-bucks Manchester City was always gonna be in it. City's 0-2 dissection of Everton was surgical in its precision and deliberate in its deployment. The Toffees figured their best chance was to hang back on defense and wait to launch counterattacks, mainly with the Brazilian Bernard as the point man. The Citizens merely parried each thrust and waited, too, for an opening to get into their usual game flow. Thus, the first half was scarce in terms of clear chances. After the break, the visitors seemed to be a much more inspired side, and they were much closer to a second than to conceding the equalizer. Gotta say, though, the Citizens couldn't transform promising situations into actual goals. Finally, in the 97th minute, the capper came, thanks to two substitutes. Kevin De Bruyne got possession, drove forward, and fed Gabriel Jesus, who maneuvered behind Everton's defense and let loose. City's lead on the 'Pool is tenuous with a better goal difference, but the Reds have a game in hand. Then again, it's only February.